Rajmahal Art Silks are lustrous and versatile threads that work wonderfully for many forms of needlecraft, adding a very special finish to even the simplest of work. 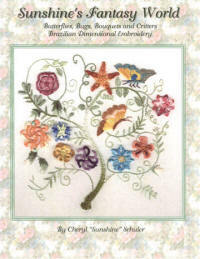 Rajmahal Art Silk is wonderfully suited to needlework of all types, including Brazilian, Stumpwork, crewelwork, miniature embroidery, petit point, cross stitch, Goldwork, Sadi, Shisha, canvas work, silk ribbon, Hardanger, White work, smocking, lace-making, tassel and fringes, braiding, weaving. Although I have made every effort to make the colors to appear exactly as they are - some monitor variances may occur. As the threads are hand dyed, please ensure that you have enough of each shade to complete your work. 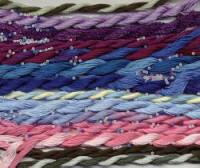 The Art Silk thread is 6 stranded, 65% viscose rayon, 35% silk floss. It comes in 8 meters/ 8.75 yard skeins. Rajmahal Art Silks are dyed so that shades are complementary to provide perfect shading. Art Silk colors range from the very rich and exotic, to delicate subtle pastels, on to the complex and deep renaissance shades. The numbers given on the Shade Card indicate related shades. Enter the quantities that you would like in the boxes and press " Add " or you can enter quantities and scroll down to the next " Add to Cart " button. The top half and the bottom half each have their own buttons..